Immersed tube, also called Sunken Tube, technique of underwater tunneling used principally for underwater crossings. The method was pioneered by the American engineer W.J. Wilgus in the Detroit River in 1903 for the Michigan Central Railroad. The immersed tunnel, also called Sunken Tube, is a tunnel construction method commonly used for crossing a body of shallow water. The method has been widely used for about 100 years, and more than 150 immersed tunnels have been constructed worldwide. They mainly serve as road or rail tunnels, but immersed tunnels are also used for water supply and electric cables. The traditional European method for constructing an immersed tunnel is to establish one or more casting basins as open excavations, where the individual tunnel elements are constructed. Each tunnel element is composed of several segments. 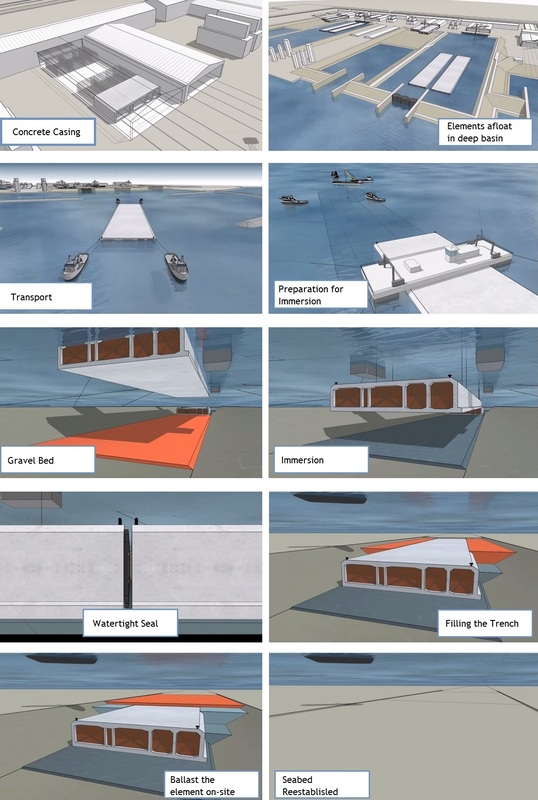 When the elements are completed, they are sealed this temporary bulkheads are the casting basin is flooded one by one to their intended location, immersed into their final position on the seabed, are linked together. The tunnel is normally placedin in a pre-dredged trench in the seabed of the waterway. The connection to the land surface is normally connected to a cut and cover tunnel to overcome the level between the water and the land surface. Parallel to immersion process, refurbishing of the the tunnel can be carried out in the elements already in place. Environmental impact of tube and underwater embankment on existing channel/sea bed. Tubes can be round, oval and rectangular. Larger strait crossings have selected wider rectangular shapes as more cost effective for wider tunnels.